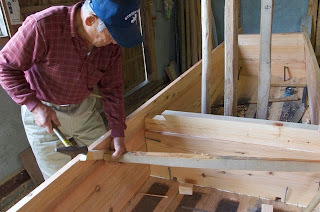 Today Murakami san installed a bulkhead and two main beams in the boat. The joinery is very interesting, but well understood within the Japanese boatbuilding tradition. 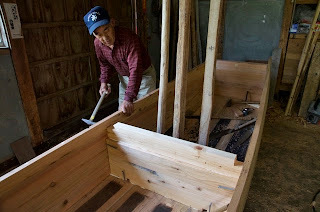 Many types of small boats (and Edo-era ships) were framed with only horizontal beams, which typically were through-tenoned in the planking and wedged. I will leave it to captions, below, to try and describe the process. Murakami san pounding the endgrain of the bulkhead, while Angela looks on. 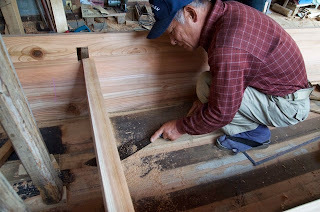 An earlier post talks about kigoroshi, pounding faying surfaces to get a watertight fit. Basically this is Murakami san's go-to technique, at the expense of other techniques I have been taught in Japan. 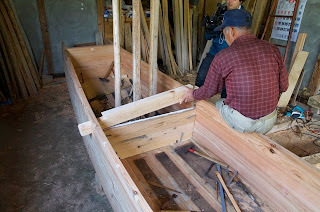 The compressed wood fibers will swell tight in the seam once the boat is in the water. Murakami san using a saw to fit the bottom of the bulkhead to the plank keel. 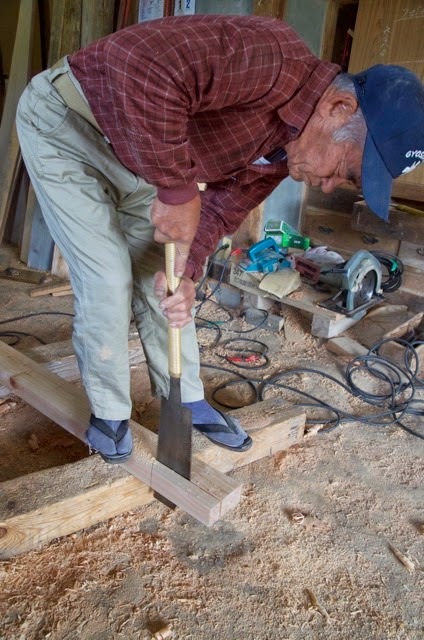 This is called suriawase, a technique commonly used by boatbuilders, but used only rarely (perhaps only here) by Murakami san. 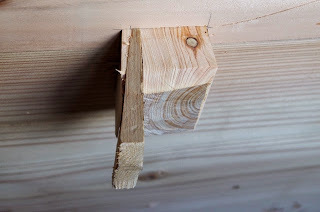 He used an L-shaped took to reach inside the beam mortise and pound its edges. 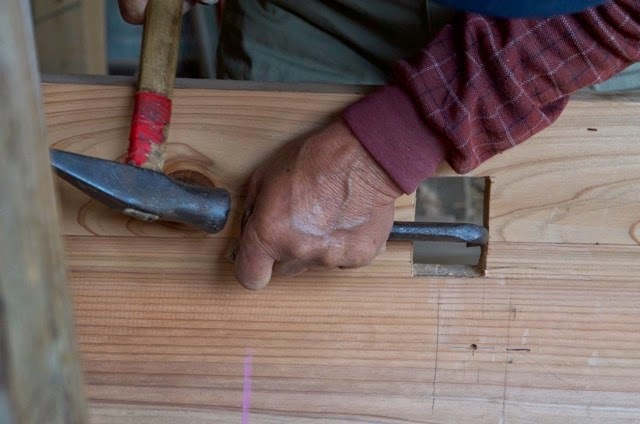 The beam is passed through one mortise far enough so the other tenon can drop inside the boat and be inserted in its mortise. 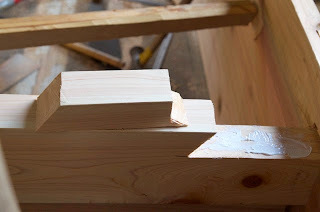 The tenons are shouldered on the top only. Murakami san drives the beam back until it shoulders against the planking on the right. He then wedges the hull open about 3/4 of an inch on the starboard side. Note the angled cut in the beam. The piece on top is the offcut, let's call it a key. He has spread glue on the beam and the offset will fit tightly back in place, but note the small wedge-shaped "tenon" left at the other end of the key. This will fill the top of the mortise and lock the key in place. The finished joint seen from inside the boat. The beam rests on top of the bulkhead. 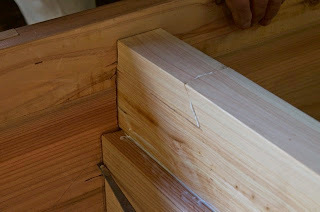 The mortise flares open aft and Murakami san inserted a cedar wedge, spreading the beam end to fill the mortise. This gets cut off almost flush later. The beams are hinoki. 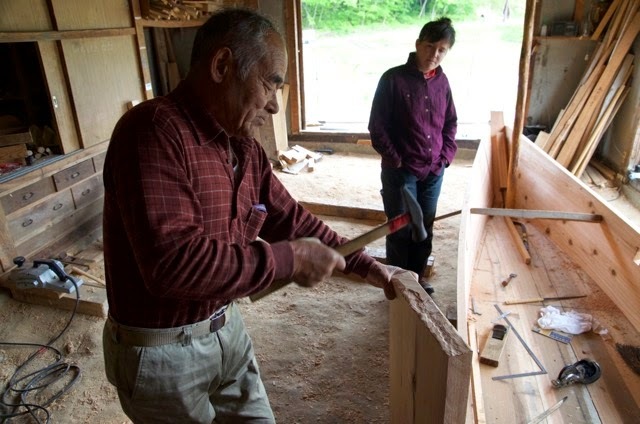 Angela and I have talked about how crucial kigoroshi is to Murakami san's building and we recognize that we need to make step-by-step, detailed documentation of how he uses this technique. 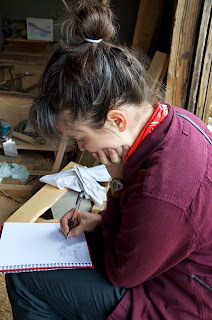 We'll have lots of photos and video but Angela is working on drawings showing the process. Thank you for this fascinating insight into the boat building process. As someone deeply interested in Japanese woodworking, but unable to go to Japan and learn for myself, this is very valuable. Thanks! A process-description of kigorishi would be much appreciated. Perhaps you could also do something similar on suriawase? I have read what I could find on you blog about this, but still unsure about the details. A question: What sort of glue is used on the boat? Yes, this boatbuilder relies so much more on kigoroshi than any other I have seen that Angela and I have been specifically talking about how to best document that process. I guess I don't have much written on suriawase, but not to be too mercenary about it, but I have a major book coming out this summer on all five of my apprenticeships which details all the techniques I have learned in Japan. 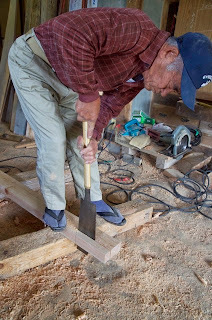 Please send me an email and I can put you on my mailing list, or feel free to email me and remind me of your request, because I have an article I wrote on Japan handsaws with a sidebar on suriawase. Email me so I can send you that. Sorry to be so abrupt but I am very busy here with this project. As for glue, Murakami puts an additive of some kind in Bondo, a trade name for a polyvinyl acetate glue popular in Japan (most Japanese refer to any blue as "bondo."). Japanese boatbuilders all tell me they do NOT depend on glue to hold the boat together (the boats get a full complement of fastenings regardless) but instead say glue keeps seams tight and dirt out of them. In the old days some boatbuilders put urushi (raw lacquer) in their seams for the same reason, but it was incredibly expensive. Three of my teachers (and now Mr. Murakami) used glue. Thank you for taking the time to reply! It looks like you're all very busy, a it's lovely to see the boat coming together. That you have a book on the way sounds very interesting, and I will happily purchase that - so I will gladly wait. Enjoy building the rest of the boat!